Naples, Florida is a well-known upscale destination for those seeking to escape winter’s chills. What fewer people realize is that Naples is also an equally lovely summer destination. The prices are lower, the crowds are gone and you can spend time with your friends being as active or as mellow as you wish. Naples is an accommodating destination for a getaway of friends who don’t all share the same interests. If you can’t be happy in Naples you probably can’t be happy! The swimmer will be happy and so will the golfer; that friend who always wanted to try deep-sea fishing can scratch that itch (or catch that fish); shoppers whose tastes run the gamut from Max Mara to Marshall’s will destroy the magnetic strips on their credit cards; there’s always some live music being played somewhere and the cuisine has a sophistication and affordability that will make you wonder if you’re really in Florida! Naples is also an easy place to have your bevy of besties congregate. The well run and easily navigated Southwest Florida International Airport (code RSW) is less than an hour outside of Naples. There are non-stop flights from Boston, New York, Chicago and many other cities and summer airfare to Florida is generally lower than fares for the same routes in the winter. It all sounds good, but how can you easily plan your Naples girlfriend getaway so the emphasis is on fun not complicated planning? The easiest way to do that is to stay at one of the lovely beach resorts in Naples. The swimmers and sunbathers will be happy, there will be a spa for pampering and any golfers or shoppers can take shuttles or cabs the short distances to enjoy their pursuits. Two of the best are La Playa Beach Resort and The Ritz Carlton Naples. It’s hard to imagine that even the hardest person to please could be less than delighted with either property but we’ll tell you some of the features of each so you can see which seems to be the best fit for you and your friends. La Playa Beach Resort boasts (fairly enough) that they are the only truly beachfront resort in Naples. And they are not only on the beach but they also sit on a bay and every single room has a water view! With 8 suites and 189 rooms this is a nice size but not overwhelming resort. Their private beach is pristine with sun bouncing off the aqua waters of the Gulf of Mexico and flags you can raise on your lounge chairs to summon the delivery of your favorite libation! The spa smells heavenly, guests are assigned personal butlers and there is an 18-hole links golf course as well as the Leadbetter Golf Academy. You will not be surprised that this is a Condé Nast Gold List property for 2014. Just a little bit down the road and around the bend is the also luxurious and recently thoroughly refurbished Ritz Carlton. The Ritz has been careful to respectfully preserve natural Florida vegetation. You walk on a wooden boardwalk through what feels like a jungle but in a few short minutes it turns into a beach. The Ritz also offers a spa of heavenly aromas and tranquility. They encourage spa guests to come early and relax ahead of their treatment sessions and it would be a mistake to pass up this opportunity. The Ritz with its 450 rooms is larger than La Playa but still manages to feel intimate in the way they deliver their trademark impeccable service. And for those of you who like to get a suite so you can gather for some fun a very nice feature of the suites at the Ritz is that they have powder rooms for your guests. No more hiding your beauty secrets in the bathroom when everyone gets together! And what about that cuisine in Naples? This is making a strong statement but if you go to Naples you must have dinner at least one night at Fuse Global Cuisine. Don’t you dare roll your eyes and think “fusion cuisine – wasn’t that the 90’s”? Trust us, this is a world class restaurant where the chef and owner, Greg Scarlatos, has a touch and taste for bringing the best qualities and flavor combinations your palate didn’t know it had been waiting for all its life! Although Fuse Global Cuisine only opened in November of 2013 reservations are already a must. They are not open for dinner on Sunday or Monday so call ahead before you even get to Naples. If you go shopping on 5th Avenue in Old Naples there are a number of very good restaurants and many have summer and/or “early bird” specials that are terrific bargains. Two we recommend are Alberto’s on Fifth and Bah! Bah! Bistro, the home of delicious Persian cuisine. If it’s lunch you’re in search of locals and tourists alike all seem to recommend Tommy Bahama’s Tropical Café in the 3rd Street shopping area. And while you’re there take the short walk to the historic Naples Pier for some people watching and a good photo opp to make your friends back home jealous! A final thing to do when you’re in Naples is to be sure that you get out on the water to see the city from that perspective and learn some of Naples’ interesting history. The Naples Princess has sightseeing as well as sunset cruises on a very nice boat with an attentive crew and indoor air-conditioned and open-air upper deck options. When you go home (assuming you do) and tell your friends and family about all that Naples has to offer you should realize that you will probably be returning with a larger group the next time! Kay Dougherty is the author of the travel blog BlondeBrunetteTravel. The blog is humorous, often irreverent, and is about Kay and her sister (The Brunette) traveling the world. You can also find Kay on Twitter at @BlBrTravel. I’m a huge fan of the “Easy Button” and this is a great one to push! 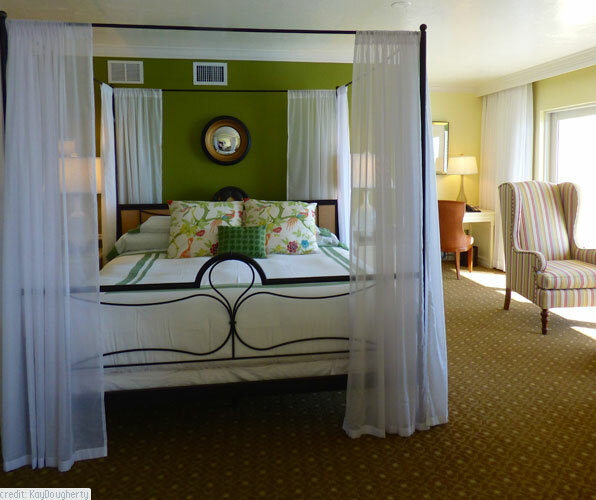 I’ve never been to Naples, what a great start to the get away with accomodations like that…hmm can i try both? You can certainly try both as long as you’re feeling flush! Another thing, is that Naples gives girls a good excuse to dress up. It’s a wonderful destination and now I know that I’d like to stay at one of those resorts (or both, eventually). You’re right – women in Naples tend to look quite snappy and plenty of nice stores will be happy to sell you things so you fit right in! The Shops at Waterside are near both of these properties and they have a Nordstrom, Saks and a good selection of upscale retailers. What beautiful sunset photos that just capture the peacefulness of the area. I assume this was during the winter months since we’re having a heat spell this month here too. 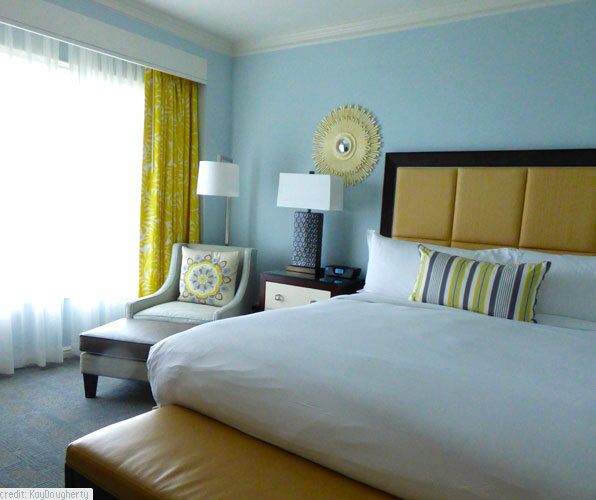 The hotels are so perfect for a relaxing with your bestie(s). I can’t take credit for the sunset photo but in general there are gorgeous sunsets in Southwest Florida and people make the most of them. The sunset cruise was really enjoyable. You can never go wrong with The Ritz Carlton but La Playa’s beachfront location sure sounds tempting too. This was the resort version of Sophie’s Choice! The best solution is to do two different trips and experience both of them! Sounds like, as you said, Naples has something for everyone and is a wonderful place to settle down for a few days of pampering. 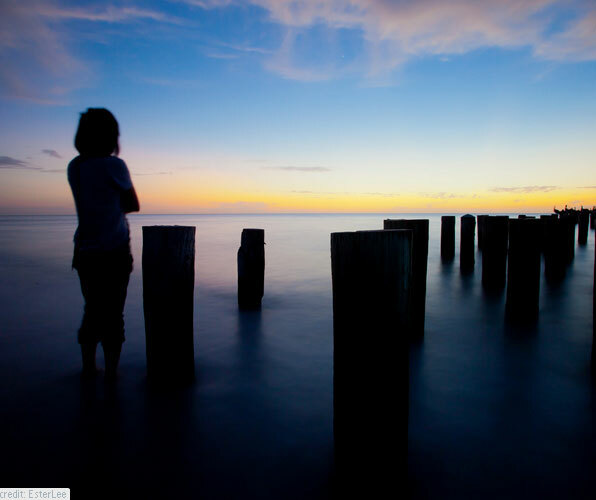 Your last photo, the silhouette of the the woman and the pilings is lovely! Thanks Anita but I have to confess that that isn’t my photo but I really like it too! Naples really is a lovely place. I was never ever a fan of Florida in the past but I’m fairly hooked on Naples. Sounds great! Everyone could use a little pampering at the Ritz! Time to start planning. I couldn’t agree more – especially after this winter! Your photos are quite inviting. Thanks for sharing. Fuse Restaurant is the Best Restaurant in Town. Not only is the food Fabulous but the service and the Specialty Drinks are too. The owners are very friendly and will do anything to make your dinner experience the best EVER!! I have lived in Naples since 1965 and I could mention many other restaurants that are also very good but I have to say that this is my Favorite by far. It’s very quaint and personable. The atmosphere is nice and the flavor of the food will indulge your taste buds. Isn’t it a wonderful restaurant? You have me thinking it might be time for a return visit!